Optical communications networks are an essential part of the world wide te- communication infrastructure . The number of users of present and future telecommunication services like Internet, web browsing and tele-education is expected to increase dramatically . As a consequence there is an imminent - mand for high broadband and high capacity communication systems. A prom- ing solution is found in the concept of all-optical networks . These networks exploit the vast capacity of the optical fiber by using multiplexing techniques that allow for an overall capacity of terabits per second. Channels are routed and switched in the optical domain . In this manner data channels are carried from the receiver side to its destination making use of optical transmission techniques . Wavelength division multiplexing (WDM) is a transmission technique that has dramatically increased the capacity of optical transmission systems. WDM allows for transmission of several channels over a single optical fiber by - ing different wavelength as the channel carrier . Optical switching and routing techniques are also being developed to cope with the high data speeds and n- ber of channel carried in the optical fibers. These functionalities are provided by optical crossconnects. 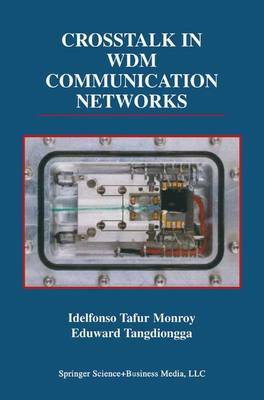 The use of transmission techniques such as WDM in combination with optical crossconnects is enabling optical networking at high bit-rates reaching terabits per second . These techniques also offer ways to improve the network flexibility and configurability .